In the human body, bio-magnetism is the result of blood pulsing through veins and arteries, nerve energy moving at lightning speed through the channels and meridians, and the slower flow of lymph, digestion, breathing, and growth of hair and nails, we find what we can assume to be an aggregate electric current, which can be measured in millivolts and which ranges between 0 and 70 millivolts. At 0, you are dead or at death’s door, and at the opposite end of the diapason, 70 millivolts, you can’t get any higher—you are fighting fit. Most people, in my years of collecting data, come in at the lower end of this range, around 20–35 millivolts, which for most people is too low as the circulatory system is probably struggling and the immune system is in poor stead. The only immediate way to stimulate this component, as I understand it, is via biomagnetism. (Biomagnetism is quite simply the magnetic field as applied to living substance, especially the human entity). Physically it might be the combination of magnetism (coming from the earth, so perhaps akin to Daoist yin energy) and what we call electricity (coming from the cosmos, again probably related to yang energy), combined in the body to form life, while following specific patterns in their flow. There seems to be a natural law which could be summed up as follows: Boost the biomagnetic field and the electric will profit, with a knock-on benefit to the immune system. A most useful indicator of human well-being as indicated is the individual biomagnetic charge. The way of measuring this is quite vicarious and of my own invention. I use a pendulum and a graphic chart on which the biomagnetic range goes from 15 to 75; there is no unit of measurement per se and no registering of the electron spin or other movement. As the unit of measurement used to record the magnetic field of the earth is a microtesla, ranging between 25 and 65 microteslas for the earth’s charge, I suspect that the same values can be applied to humans. The results I have found do correspond to this range. There is a very useful biomagnetic recharging exercise that I strongly recommend for one and all, not just those suffering from poor immunity. This involves joining your hands, interlacing the fingers, regardless of the polarity in the hands. The negative and positive polarities will be joined. Now, your feet. Those with right-handed positive polarity, put your left foot over the right ankle. Conversely, for left-handed positive polarity, put the right foot over the left ankle. You will find out after five minutes if you made the wrong choice. You will feel enervated, so change the position of your feet. With hands and feet joined, sitting at your desk, on the bus, lying down, wherever, it doesn’t matter but do it whenever you can. By doing this you have closed the biomagnetic loop of the body’s field and it is recharging. Why do that? The current of the blood’s movement through the veins and the energy through the meridians result in an electric charge, measured in millivolts. Ten millivolts, and you are at death’s door; at seventy millivolts—and you will not get higher—you are fighting fit. Most people come in at twenty-five millivolts, which is weak, indicating that the immune system is probably struggling. No one, to my knowledge, has ever pointed out that this is just what you are doing when sitting cross-legged in meditation, one hand in the other, but no matter. One often sees old people in this position; maybe their bodies react instinctively. Occasionally when working with bed-ridden patients who are so weak it seemed advisable to introduce a gentle start to energetic input, I have found that a round river rock, worked by water for thousands of years and magnetically charged in the process, provides a very constant source of vital force, as opposed to the abrupt and powerful surge that might result using other means, as for example human hands in the practice of magnetism or laying on of hands. The flow of biomagnetic force in humans and perhaps all other living bodies, including plants, follows a pattern, up and/or down in a vertical direction depending on the time of day or night, always following a centripetal or centrifugal spiral form on the planar level. As Viktor Schauberger points out, heat causes expansion or centrifugal motion from the central point, as does electromagnetic force. That centrifugal action can and does disrupt the cohesive force of biomagnetism. A factor to bear in mind. Likewise, sound or tone has the capacity to cause unity, order, and form in a substance, thanks to its centripetal or contracting effect, but if you add a pulse or heat, as with a microwave component in mobile telephony or radar, the effect is disruptive to biomagnetism with its suctional forces at the poles. One finds a ready example of this destructive force of sound combined with pulse in many forms of contemporary dance music. The naturally harmonious, positive and negative arrangement of biomagnetic polarity in the human body is generally constant for the duration of a lifetime. There are circumstances in which certain aspects of the arrangement can change, most notably for women at menopause, when their biomagnetic polarity changes. This fact is patently ignored by modern medicine, perhaps most other systems too, however there is some relief to be found in magnetic recharging. Certain vital organs have a constant, specific polarity for the entire lifetime of the individual. Contrary to what many people maintain, the polarity of human limbs can change, but that may be a recent phenomenon due to the surge in the past one hundred or so years of electricity, mobile telephony, wireless devices, personal computers and other electronic gear, air travel, the earth’s weakening magnetic field (due to the extraction of oil and minerals), and so forth, likely resulting in the perturbed magnetic patterns commonly encountered nowadays. Quite what the exact nature of the biomagnetic arrangement is remains unknown, but it would seem to involve electret and magnet properties. The weak fields are nevertheless sufficiently strong not only to sustain life but to ensure internal and external relations, a constant communication of human metabolism with everything going on in the outside world. The two vital organs in the human body with a constant biomagnetic polarity are the heart, with positive polarity, and the liver, with negative polarity. This applies to all people and animals I have tested. As we shall see in the section on hun and po in chapter 5, these two organs play their specific roles as hosts and are probably strongly influenced by the presence of the hun or po. In passing, the region of the navel is neutral. Generally speaking, men have a positive charge emanating from the palm of their right hand and a negative one from the left. Men who were born prematurely or who are gay often have the inverse polarity, making the left palm the positive and the right, negative. Women, in contrast, have a positive charge emanating from the palm of their left hand; women born prematurely or who are lesbian may have inverse polarity, and almost invariably at menopause their polarity switches, the right hand becoming positive and the left negative. This last observation might explain the severe changes to women’s hormonal system, as experienced with flashes and other uncomfortable effects. It is not an instantaneous reversal but a gradual process, hence the inconvenience and discomfort of menopause lasting in some cases for several years. The condition of being right- or left-handed, even ambidextrous, seems to make little or no difference to the biomagnetic polarity of the palm of the hand. 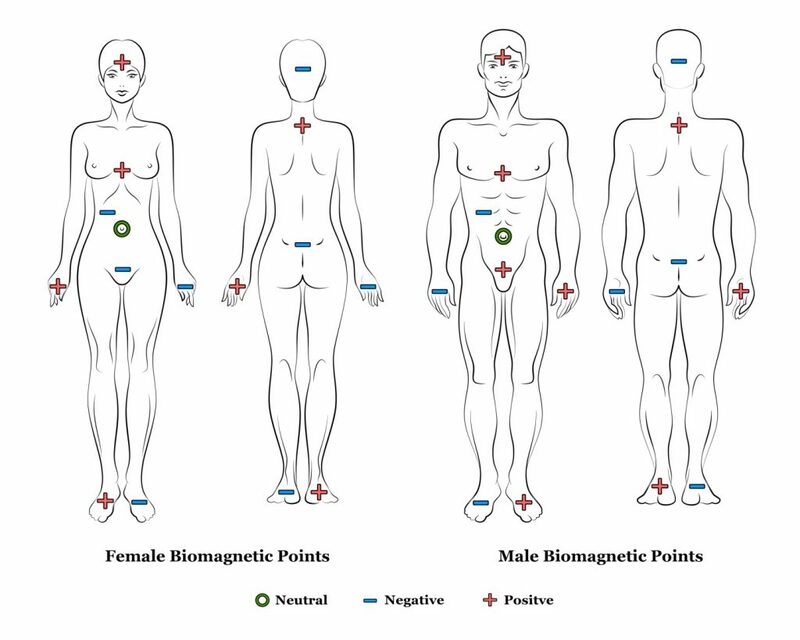 The images below shows the locations of general biomagnetic points in the human body as explained above. Another constant in human biomagnetism resides in the spine and head and this applies to man and woman alike. Systematically, the front of the head (forehead) is positive, which is probably due to the energetic flow of the telluric force streaming outward at the level of the eyes via the pineal gland, and the cosmic frequencies coming in through the top of the head to access the pituitary gland before spreading down through the body. The back of the head is negative. With the same constancy, the back of the hand will have the opposite polarity to the palm, irrespective of the polarity of the palm. If the left hand is positive, the right foot will be positive too, and vice versa for the right hand and left foot. The top of the spine is systematically positive and the base of the spine negative, useful for the positioning of biocircuits in relation to the hands and feet. What I’ve described above concerning human polarity has apparently not always been so. Franz Anton Mesmer (1734–1815) observed that all points on the left side of the body have the opposite polarity to those same points on the right side. He believed that the poles can be changed, communicated, destroyed, and intensified. Baron Karl von Reichenbach (1788–1869) found that the left hand has negative polarity, as does the od (vital force) in that hand, in both men and women. Hector Durville (1849–1923) maintained that negative polarity is to be found on the left side of the body, likewise for both men and women. Leon E. Eeman (1889–1958) found that both men and women had negative polarity on the left side, unless they were left-handed, in which case the polarity was reversed. So, serious experimenters ranging from the eighteenth to the twentieth century have different things to say regarding human magnetic polarity. From this evidence, some larger transformation is clearly taking place. It is a measurable fact that the earth’s magnetic field is weakening. It would therefore be logical that this has a subsequent impact on humans. Whatever the answer, it is apparent that the different researchers above did not ask the same questions during their respective experiments. In all probability, no questions regarding polarity were asked, it is only too natural to take a given fact for granted. (f) what is the individual’s emotional/mental state. This is not an exhaustive list but would help ensure more coherent and consistent data. In all probability, the early researchers asked their subjects no questions at all because they were simply not familiar with the possibility that these factors can vary, and they were perhaps even less familiar with modern scientific methodology, even if they believed there might have been some merit in interviewing their subjects to gather as much data as possible. The confusion over the centuries concerning magnetic polarity in the individual’s hand could have been avoided if each person had been checked before, during, and after the experiment. Because our understanding is deficient in these matters, as is only natural if we do not recognize the importance of biomagnetism in the individual, it could be beneficial to revise our way of looking at things, which, as we know, develops, evolves, and sometimes regresses. We can clearly draw no conclusions from these past experiments because of the lack of recorded parameters and it does not really matter, but in my experience it is definitely worthwhile asking on each occasion, with a pendulum or some type of muscle testing method, the questions above. Not only is the magnetic north position moving eastward at a faster rate each year, but data gathered fifty years ago is no longer necessarily valid today. The causes, as always, are beyond our ability to explain with any confidence, but one thing is for sure: if you don’t ask, you are unlikely to realize that you don’t know. We should be aware of falling into the habit of dogmatically maintaining that a given problem can be worked out in precisely a certain way, as is so often the case today, with endless clichés about one practice being the “best” and another the “worst,” don’t eat this, eat that, avoid this, embrace that. It would be naïve and even impossible, even for an expert in the relevant field, to hold that a given practice is unequivocally better than another. Each individual will respond differently to the same set of conditions. If we all had the same metabolism, allopathic medicine would work across the board and good health would be guaranteed for all, but unfortunately that’s not the case. Yet for some reason we tend to accept solutions without question if we think we’re getting a fair deal—we convince ourselves that we can benefit, if only we accept certain conditions. But it is those conditions that are debatable, that might not hold up under rigorous intellectual reasoning. In our haste to find a solution, we’ve stripped intuition out of the equation, and it’s only in our heart’s intellect that we can hope to find a true solution; it is our heart that has a connection with what is, rather than what our head dictates. We know where pure rationality takes us, and how easily it can be manipulated to the advantage of a few.